Marshall: the sound of guitars, the humming of bass and the sound of rock’n’roll. But that sound is no longer reserved for musicians, since for some time now there have also been speakers and headphones manufactured by Marshall. The newest member of the family is the Kilburn II, and although it’s small, it’s got it all! With Marshall speakers and headphones, you’ll always pay a premium for the brand name and the iconic design. That much is clear. Nevertheless, 299 dollars is quite a hefty sum for a portable Bluetooth speaker, no matter how good it looks or how good it sounds. 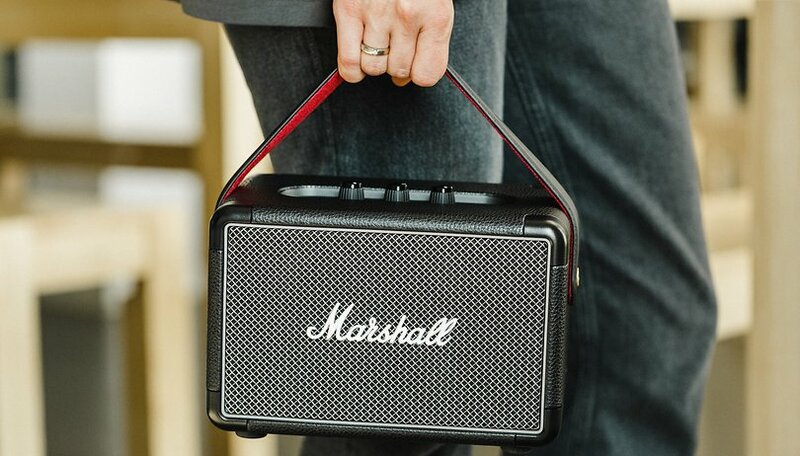 When you purchase a Marshall speaker, you get excellent design . The Kilburn II doesn’t disappoint. The classic aesthetic features great lettering, a rugged grille on the front, reinforced corners and thick rubber feet. That’s all that I’d expect from a Marshall speaker, and the Kilburn II is no exception. The Kilburn II is perfectly manufactured, robust and high quality. The metal knobs switch the device on and adjust the volume, bass and treble. The small round button is used for Bluetooth pairing. A small red light indicates the battery level. Marshall points out that the Kilburn II, unlike its predecessor, is now protected against water. This is nothing special in itself, as there are plenty of other waterproof speakers on the market. But that’s not exactly what the Kilburn II is, since IPX2 only means that “light splashes of water” won’t destroy the speaker. Let’s be honest: most devices can withstand this without any certification, so Marshall could have saved itself the trouble. The Kilburn II has a leather strap for carrying around which is padded with soft red velvet on the inner side. It has two pins that are similar to those used for an electric guitar. This fits perfectly stylistically. With a weight of around 6 pounds, so the Kilburn II is anything but light, and the speaker isn’t overly compact either. You’re unlikely to carry it around very far. The speaker can’t play anything aside from music . It can’t play anything aside from music. There’s no Google Assistant or Alexa in it. It can’t be connected to a multi-room system or Wi-Fi to play content directly from the internet. The speaker is simply coupled with a smartphone or other devices and plays back what it’s delivered. That’s it. You might find it outdated, and you’d be right about that. But perhaps that means you just find the price to be a tad audacious. In my living room, smartphones, Echos, a Google Home and a Fire-Tablet can listen to my commands, so do I really need another smart device? If you pair the Kilburn II with the Google Home or Amazon Echo via Bluetooth or a jack cable, it will become smart. That’s a detour, yes, but not particularly awkward. I quite like that the Kilburn II has been trimmed down to the essentials. The Marshall Kilburn II contains three speakers, each with its own amplifier. The bass speaker has a 20-watt amplifier, and to two tweets are 8 watts each. A total of 36 watts, which according to Marshall can produce a maximum sound pressure of 100.4 dB SPL at a distance of one meter. The low frequencies are routed via the bass reflex from the rear of the speaker. The Kilburn II is multi-host capable, so it can be paired with several devices simultaneously via Bluetooth and supports Bluetooth 5.0 aptX. For its size, the Kilburn II is one thing above all else: damn loud . I’ve tried a lot of Bluetooth speakers, but none can handle so much pressure as the Kilburn II. So you don’t have to be afraid to turn the knob all the way up, since the sound stays stable and doesn’t overdrive. Full power is no problem for Marshall, and the Kilburn II is easy enough to fill a medium-sized party with sound. That’s quite impressive! Thanks to the multidirectional sound, the whole room will be filled quite evenly. The sound of the Kilburn II is quite warm and you could call the bass heavy, even if the knob isn’t turned up too much. Especially in smaller rooms, you might want to turn the knob down and increase the treble instead. The Marshall audio is still full and powerful. If you use the speaker outdoors, you need the bass to be set to at least 7 or 8 for quality sound. As you probably already know from other Marshall speakers and headphones, the sound of the Kilburn II isn’t necessarily neutral so might not be suited for all kinds of music. Classical music will lack a little clarity. But if you like rock, metal, punk or folk, you’ll love the sound. By the way, if you prefer to use a wireless connection instead of Bluetooth, you can go right ahead, since the Kilburn II also has a 3.5 mm AUX port on the back. But if you have to bring a jack cable to connect it. The device only comes with a power cable. The exact capacity of the Kilburn II’s battery is a proud 20 hours or more with one charge . Manufacturers’ specifications should always be treated with a little caution, but Marshall headphones always provide quite reliable specs. With as powerful of a speaker as this, a lot depends on volume. If you turn the speaker all the way up, the quality is much worse than at room volume. 20 hours of autonomy isn’t unrealistic. We usually got around 18 hours of battery life at a volume of just under 50 percent. That’s great for a portable speaker, even though the Kilburn II is quite a large device. We did, however, have a defect in our first test device and it didn’t last more than 45 minutes. We exchanged it for another speaker that worked fine. The Kilburn II can be charged with a normal outlet, via USB it might take too long. In about three hours, the battery in the Marshall speaker will be full again and the Kilburn II is ready for the next party. I really like the Kilburn II, although personally I hardly ever need one of the most important features: the battery. Sure, it lasts really long, but I don’t ever bring the speaker outdoors, so I’m always near an outlet. I would’ve been happy with less, but it’s nice to know that the battery won’t run out quickly. The sound is more important to me, and it fits my ears and musical taste. Although the Marshall sound isn’t suitable for all kinds of music. You should know that beforehand, but with some genres Marshall hits the nail on the head. And yes, it gets loud! That just leaves the price. 300 dollars for a Bluetooth speaker is a lot of money. The Kilburn II doesn’t have the Google Assistant or Amazon Alexa built in and can’t be integrated into a multi-room system like Marshall’s Connected series. The design, reputation, sound and battery life are all great, but the Kilburn II is actually a bit expensive. But in some cases, less is more.